CAPE CANAVERAL, Fla. (Reuters) - A Space Exploration Technologies Dragon cargo capsule made a parachute splashdown into the Pacific Ocean on Thursday, wrapping up a five-week stay at the International Space Station. The capsule blasted off on April 14 aboard a Falcon 9 rocket from Cape Canaveral Air Force Station in Florida and arrived at the orbiting outpost three days later with more than 4,300 pounds (1,950 kg) of food, supplies and science experiments for the live-aboard crew. It was repacked with 3,100 pounds of science samples and other equipment and released back into orbit at 7:04 a.m. EDT (1104 GMT) on Thursday for a return trip to Earth, a NASA TV broadcast showed. Riding beneath a trio of parachutes, the capsule landed in the Pacific at 12:42 p.m. EDT about 155 miles (249 km) southwest of Long Beach, California, the National Aeronautics and Space Administration (NASA) said. The returning cargo includes roundworms that are part of a medical study to assess physiological changes that impact aging. A second investigation is looking into how the microgravity environment changes the worms' muscle fibers, information that may provide insight into mitigating astronauts' loss of muscle mass during long-duration flights. SpaceX, as the privately-owned company is known, is one of two firms hired by the U.S. space agency NASA to fly cargo to the station following the retirement of the space shuttles in 2011. Owned and run by technology entrepreneur Elon Musk, SpaceX made a test run to the station in May 2012 and is now halfway through its original 12-flight, $1.6 billion contract with NASA. NASA last year added three more flights to SpaceX's agreement, for an undisclosed amount. SpaceX's next launch to the station is slated for June 26. NASA's second supply line to the station is temporarily grounded, following a launch accident in October. The contractor, Orbital ATK, is revamping its Antares rocket and hopes to be flying again in March. Meanwhile, it is buying a rocket ride for its next Cygnus cargo ship from United Launch Alliance, a partnership of Lockheed Martin and Boeing, with launch targeted for late this year. Russia and Japan also fly freighters to the station, though an accident, which remains under investigation, claimed the last Russian Progress capsule in April. 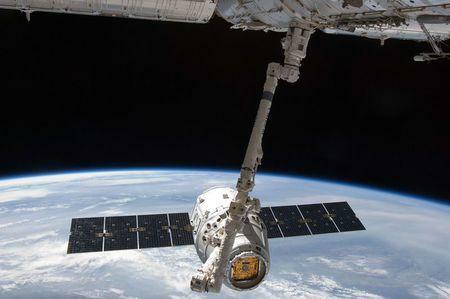 SpaceX is developing a version of the Dragon capsule to fly astronauts and expects to begin test flights next year.